There is an old saying, that goes, “A man’s character is never developed in a crisis, but a man’s character is merely revealed in a crisis”. And there may be some truth to this saying. For example, there was a certain Christian in an airport, waiting for his flight to arrive, so that he could go home. But that flight was late, and a substitute flight was announced. But when even the substitute flight didn’t arrive on time, this Christian began nervously walking back and forth, and asking fellow passengers if they had heard any new information on the flight’s arrival. And finally one of the fellow passengers laughed and said, “Hey guy! You really look worried! Maybe you should read the writing on your own ball-cap! 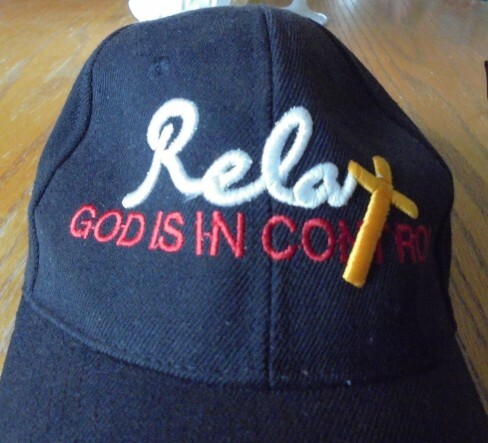 It says, ‘Relax, God is in control!’ Don’t you trust that God’s in control?” And the other passengers there all laughed, too! PERFECT PEACE DURING A CRISIS? But just how in the world is a Christian supposed to maintain perfect peace during the many troubles which this life will assuredly bring our way? Oh yes, it’s easy to have peace when things are going smoothly. Sailing on tranquil waters is not a problem! But how about when the storm clouds roll in? How about when the waves start crashing against your boat? And the boat begins to fill with water? Then how are we to maintain that perfect peace? OK, so we need to keep our minds stayed upon Jesus! And so, Jesus awoke and stilled the storm. And even though this was a true and historical account, it teaches us an important lesson about faith. Now here in this true story of Jesus stilling the storm, we are given a perfect little picture of how NOT to react during a crisis. The disciples totally crumbled under the dire circumstances of the moment! They expressed their doubt that Jesus truly cared about them! And isn’t it so true that if we would only fight to keep those Bible promises before our eyes when bad news does come our way, we could maintain that perfect peace, even amidst our supposed troubles! But even though this faithlessness during crisis might be our past modus-operandi, the times just ahead will require a much greater faith! So let’s not wait for the coming crisis to strengthen our faith. Let’s be hiding all those precious Bible promises in our heart, right now! TO READ PART 5, GO HERE…NOVEMBER 24 (How To Find Perfect Peace, Part 5: Seekest Great Things? Seek Them Not! This constellation almost appears as a vine, as it projects out from the Altar/Ark Constellation . This constellation appears in mid-winter through late-spring. 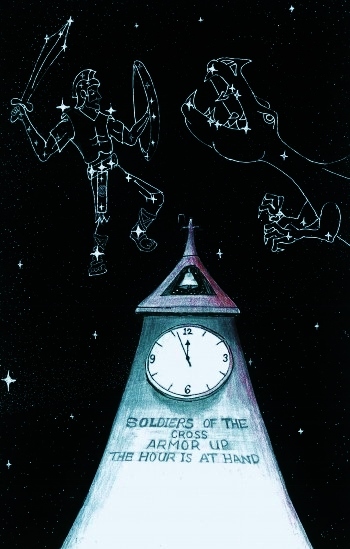 As you can see in this sketch, the Altar/Ark Constellation is also known as Leo Major , and the stem or vine of the flower is made of stars of the Virgo Constellation, and the flower itself is made of the Corvus Constellation.